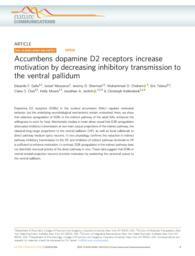 Gallo, Eduardo F.; Meszaros, Jozsef; Sherman, Jeremy D.; Chohan, Muhammad O.; Teboul, Eric; Choi, Claire S.; Moore, Holly M.; Javitch, Jonathan A.; Kellendonk, Christoph B.
Dopamine D2 receptors (D2Rs) in the nucleus accumbens (NAc) regulate motivated behavior, but the underlying neurobiological mechanisms remain unresolved. Here, we show that selective upregulation of D2Rs in the indirect pathway of the adult NAc enhances the willingness to work for food. Mechanistic studies in brain slices reveal that D2R upregulation attenuates inhibitory transmission at two main output projections of the indirect pathway, the classical long-range projections to the ventral pallidum (VP), as well as local collaterals to direct pathway medium spiny neurons. In vivo physiology confirms the reduction in indirect pathway inhibitory transmission to the VP, and inhibition of indirect pathway terminals to VP is sufficient to enhance motivation. In contrast, D2R upregulation in the indirect pathway does not disinhibit neuronal activity of the direct pathway in vivo. These data suggest that D2Rs in ventral striatal projection neurons promote motivation by weakening the canonical output to the ventral pallidum.